Toast hazelnuts in a 350-degree oven until dark, about 20 minutes. When the nuts are cool, rub them in your hands to release the papery skins. Don’t worry if they don’t want to come off, just remove what you can. Chop them in a food processor until finely ground (or simply chop them with a knife). In a small saucepan, bring 1 cup cream just to the boil. Turn off the heat and add the nuts. Cover, and allow to steep for 30 minutes. Transfer to a bowl or Tupperware container and chill overnight. The next day, pour the cream through a fine mesh strainer into the bowl of a mixer, and using the back of a spatula or wooden spoon, press hard on the nuts in the strainer to push out the cream. 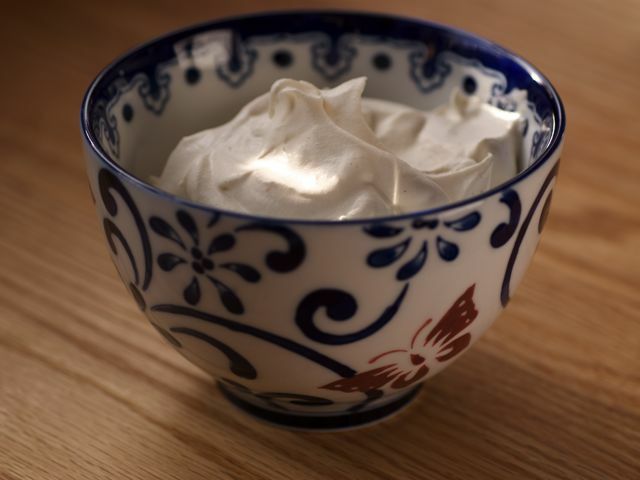 Whip on high speed with 2½ tablespoons sugar until soft peaks form. Serve.